The blog has long been a place for me to look at the technical side of Formula One but, on occasion I do find cause to cover over series. 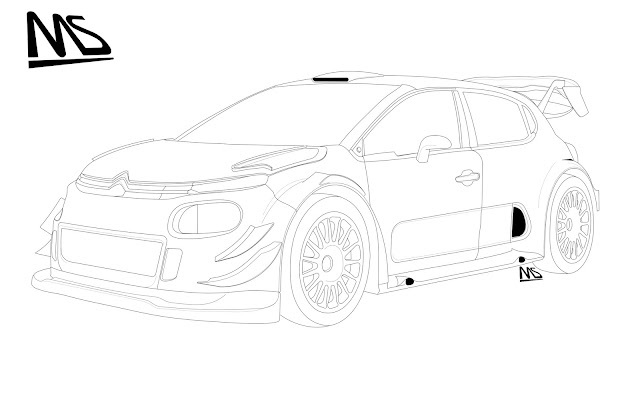 One such example of this is the changes that the WRC is undergoing for 2017. I have already covered most of this over on Motorsport.com but wanted to reuse some of the illustrations I'd completed and add to them for another look at how the regulations will change things as the action gets underway in Monte Carlo on January 20th . The 2017 regulations have been introduced to conjure up a sense of the past for fans that believe the WRC has lost its edge. Harking back to the aesthetic pleasures that their Group B fore bearers carried the new breed of cars should at least look the part, although the more flamboyant driving style of a decade or so ago will still likely be neutered. It's not all about looks though with more under the drivers right foot too, the 1.6 litre turbocharged engine is able to pack more punch due to an increase in restrictor size - up from 33mm to 36mm seeing figures closer to 400 than 300bhp. There are passive diffs front and rear but for the first time since 2010 an active central diff is allowable, allowing the driver more scope with which to tune the cars characteristics for each stage. 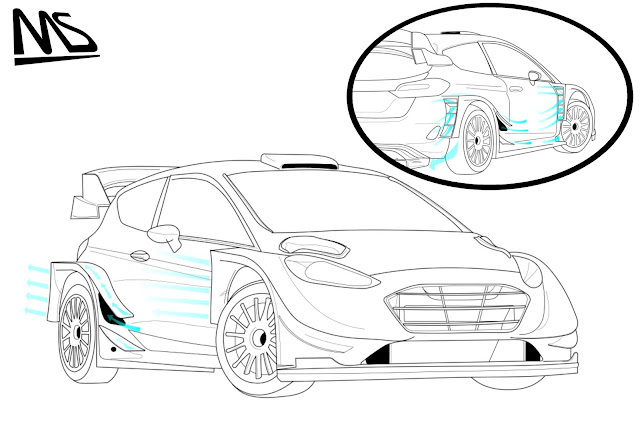 The illustration of Citroen's all new contender above shows how important cooling will be, with several inlets crafted into the front of the car in order to cool the various radiators, chargecoolers and oil coolers, whilst providing a fresh supply of cooling to meet the demands of the front brakes. The heat generated by the engine is evacuated via the side facing bonnet scoops in the case of the C3, although each manufacturer deals with each of these requirements in their own way. The changes to the cars bodywork is extensive, giving the manufacturers an opportunity to craft surfaces that deal with the extra track width that is available, as the wheels are displaced by a further 55mm. 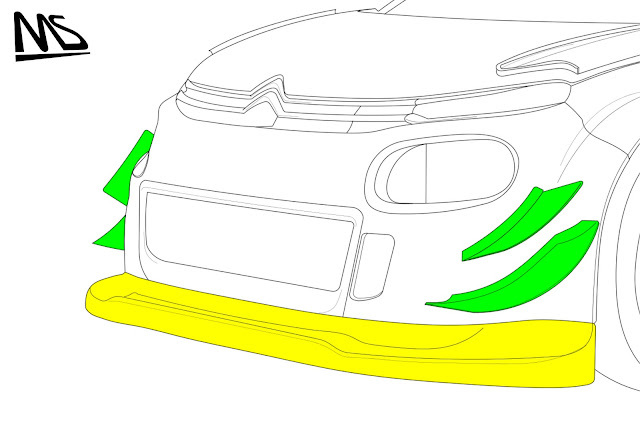 As you can see in the C3 illustration above, the bumper is significantly different to the one that would feature on a road going C3, taking advantage of the 60mm length leniency in the regulations to help place all of the inlets and craft both the splitter (highlighted in yellow) and the dive planes / canards (highlighted in green). It's understood that multiple plies will be used to improve the splitters structure in order to enable the constructors to limit damage caused on tough terrain and reduce the impact that could have on the more aerodynamically sensitive cars. The splitter, which can be removed from the bumper is shaped with purpose in order to provide airflow to the various facets of the underbody and other aerodynamic devices. The dive planes / canards are significantly sized on all four of the manufacturer's designs and all work to improve stability, reduce understeer and reposition the airflow around the flared arches. Enter the M-Sport Fiesta to show off what the new rules mean in terms of displacing airflow along the cars flanks, with the extended arches supplemented either by louvre stacks (as the Fiesta has) or outfitted with mesh, not only to control debris that can be thrown up but also the direction of the airflow as it is teased along the car. 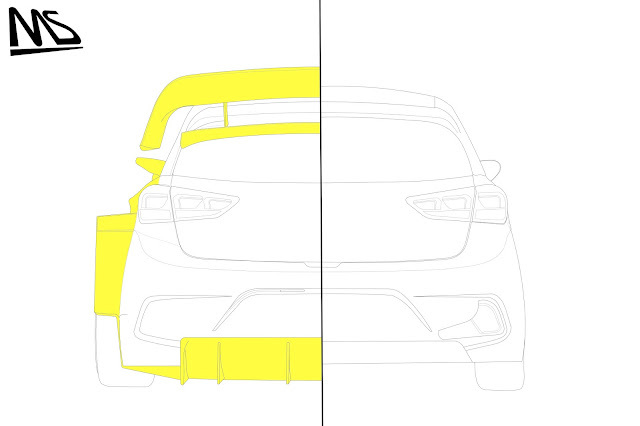 More canards and inlets can be found ahead of the rear quarter panel and are used to cool the rear brakes and supplement the rear aerodynamic devices. 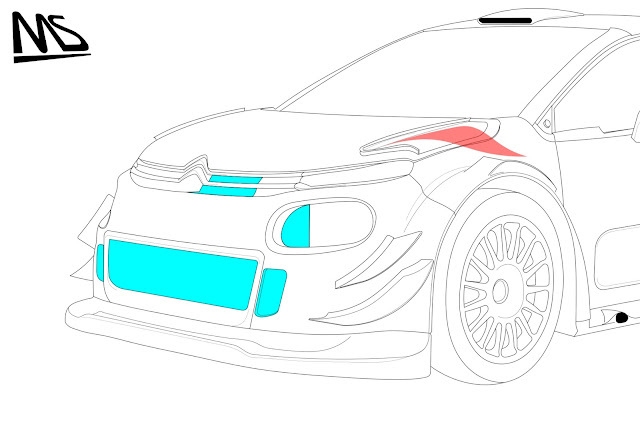 Switching back to the full view of the Citroen C3 we can see that each of the manufacturers have made different choices in terms of the side skirt design with the French marque opting to blend their skirt into both the front and rear arches, whereas M-Sport, Hyundai and Toyota have opted to disconnect the front arch and skirt, creating different aerodynamic solutions. On top of this the wide, almost flat skirts shown on the C3 have humps just behind the front wheels and ahead of the rear wheels and whilst they likely allow access to the jacking points I can't help wonder if they also serve an aerodynamic purpose too. The i20 from Hyundai is clearly and evolution of last years car, albeit in the 2 door coupe configuration rather than the 5 door they used last year. As such I suspect it will be a solid base but from a visual and aerodynamic perspective it does look a little tame when compared with the other three. Even so a quick comparison of the WRC car with its road going counterpart shows just how much wider and more aggressive these new breed of WRC cars are. If the Hyundai is the least adventurous of the 2017 cars then Toyota's Yaris must be considered the most, as it's packed with a bonkers level of detail from the front of the car, right to the back. The wing mirrors supports look like a work of art and resemble the type of effort you'd expect to see in a prototype series like F1 or the LMP1 category in WEC. Just like all of the competitors have, the mirrors have been moved further down the door panel giving the driver, who has a fixed position, a much better view out of the mirror whilst also making use of a better aero position. The rear wing (bottom right) is a complex array of surfaces that hopefully combine to improve both balance and downforce for the corners whilst paying attention to how much drag is generated in order to keep the desired top speed. You'll note how the lower wing (shovel) starts much further down the rear screen than on some of the other designs too, likely taking into account the more abrupt fall away of the cars hatch. A glance at the rest of the cars rear end shows the amount of effort undertaken, with a significant amount of louvres used around the rear wheel arch extensions to guide and displace the airflow being ejected from them. Furthermore, they've decided to be aggressive with their diffuser, mounting a large exhaust in the centre, above the it and maximising the extra 30mm's of tolerance permissible in the regulations. You might think that all of this extra grunt might sound a bit more dangerous but the FIA have taken steps to improve safety with the change in regulations too. 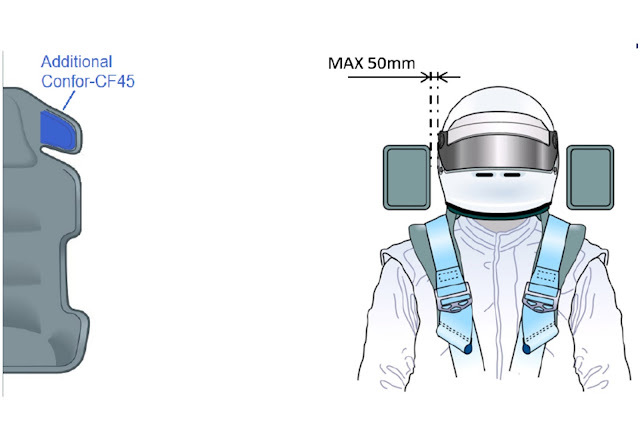 One such change comes in the shape of the seats with an additional layer of Confor-C45 fitted to the inside surfaces of the head supports, meaning the gap between the side of the helmet and the support must be less than 50mm. 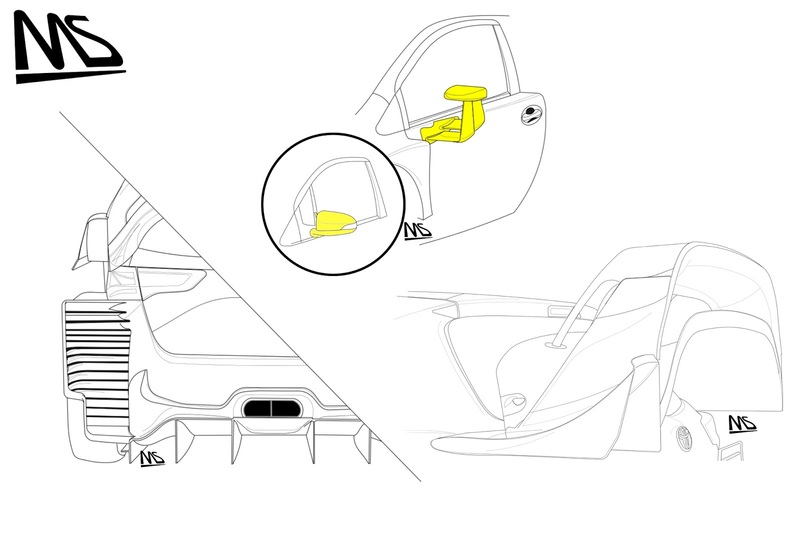 There are other changes to the seats structure and foam padding, along with their positions being moved closer together to further limit side impact incursions, whilst strengthened door panels will also play their part. 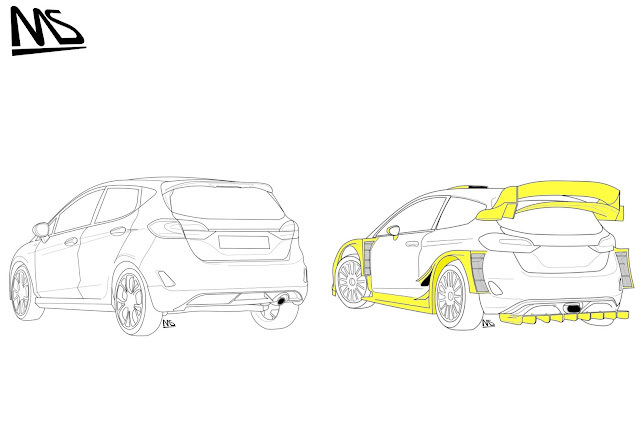 As a parting shot for those that still think even the new regulations are a little lukewarm here's an illustration of a standard 5 door Fiesta alongside the M-Sport version (yellow highlights added to show where bodywork has been added or extended). I for one can't wait to see this new breed of machines take on the varied surfaces they'll encounter around the world and for those that don't already know you'll be able to do so via Red Bull TV who'll be streaming each event.